Lithium Exploration Group: Where Art Thou Going Now, LEXG? Home» Commentary » Lithium Exploration Group: Where Art Thou Going Now, LEXG? 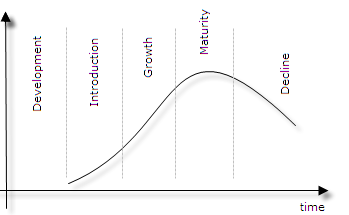 The growth phase in the product-life cycle (see below) closely resembles the initial rise in stock price of a pump-and-dump scheme. Along the same lines, the maturity or peak could otherwise be interpreted as the maximum price a pumped-up stock trades for. Beyond a reasonable doubt, Lithium Exploration Group, ticker LEXG, has long passed the growth phase. Everyone and their mother also know LEXG stock is past its prime. This leaves but one last phase: decline (see above). The $3,296,800 promotion that is currently lifting the price will end far before “operations” at any LEXG mines begin. Coupled with the questionable past of the CEO leading this charade, it gives us great confidence that LEXG stock will drop significantly in price from these levels. Source. Members who followed us made money not only betting on the downside, but the also playing the numerous bounce trades that ensued. See here and here. Our accuracy in finding winning trades is what sets us apart from all other penny stock sites. It’s what makes us the Haven of Penny Stocks. To get our Penny Stock Alerts first, you need to be signed up to our newsletter. It’s free to join. In LEXG trades and more, you can be sure we’ll keep you informed. LEXG, LEXG short, LEXG stock, Lithium Exploration, Lithium Exploration Group Inc.